The Rhys Vineyards team has been producing estate Pinot Noir and Chardonnay from some of California’s most exciting mountain vineyards since 2004. Our eight estate vineyards are situated on some of California’s coolest, rockiest hillsides from the Santa Cruz Mountains to northern Mendocino. For more information about Rhys please click www.rhysvineyards.com. In addition to making great wines, Salvo Foti is well known for his tremendous efforts to rediscover, champion and propagate the indigenous grapes of Mount Etna. Over the years he has isolated some of the best grapevines of Carricante and Nerello Mascalese in order to continue to grow the volcano’s amazing viticultural legacy. Meanwhile, Salvo produces inspirational bottlings of Carricante and from the eastern slope of the volcano as well as renowned bottlings of Nerello Mascalese from the northern reaches of Etna. GP is one of the most respected agronomists in all of Piemonte. With renowned clients throughout the region he is considered a Nebbiolo Whisperer among the Piedmontese. 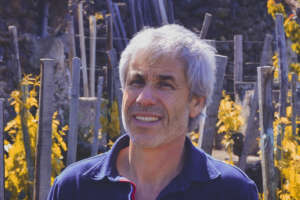 His broad experience and understanding of this challenging grape has been extremely helpful in locating a site in California where Nebbiolo could flourish.